It’s hard times for a travelling Wild West show in Mexico at the turn of the century. The T.J. Breckenridge Wild West Show, run by the fore mentioned T.J. Breckenridge (Gila Golan – Our Man Flint ), a beautiful cowgirl who does the star turn for the show, is struggling to pull in punters to see their acts. Meanwhile, a former boyfriend and business partner, Tuck Kirby (James Franciscus – Beneath the Planet of the Apes and Killer Fish ) is now working for Buffalo Bill’s Wild West show and is looking for new talent to add to the bill and has his eyes T.J.’s act. However, T.J. has a something in her possession that she thinks will turn around the fortunes of her Wild West show, because a horse jumping into a over-sized bucket of water is just not cutting it with paying public. In her possession is a miniature horse, which came to her by the hands of some local gypsies, who’s elders especially the resident crazy blind gypsy lady, which is always on hand in such films, has warned them of the curse of such things. To balance out the superstitions of the local gypsies, a visiting paleontologist, Professor Bromley (Laurence Naismith – Jason and the Argonauts and Village of the Damned ), is working in the desert looking for remains of said miniature horses, what a stroke of luck? As word spreads about the horse, both the gypsies and the professor want to steal or at least send the horse back to where it came from for one reason or another. For the gypsies, so that the curse is not fulfilled and for the professor, so that he can see the habitat of creature. 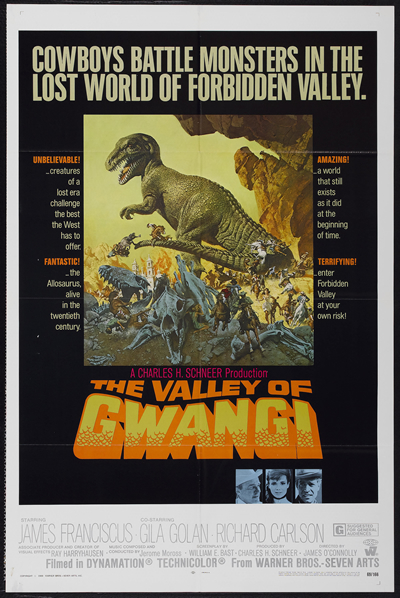 So now the chase is on to ‘The Valley of Gwangi’. With all hands to the pump the cowboys, gypsies and the professor are all off to the valley where wonders are to be found and about time too, nearly halfway through the film and not a sniff of a dinosaur or anything resembling excitement so far. However, on arrival there are dinosaurs aplenty within the valley and a number of top set pieces are played out. Dinosaurs fighting dinosaurs, cowboys fighting dinosaurs and everybody fighting everybody, what more could you want. With all this strange sights on hand, T.J. and Tuck see an opportunity for the Wild West show and decide to try a capture one of these magnificent beast, brought to life expertly as always by Ray Harryhausen. With all films which involve taking some great beast from its habitat and sticking it in the civilized world, you know things are not going to turn out well. So will the circus prosper from its new found act, will love blossom in the Mexican desert between J.T. and Tuck or will the gypsy curse be fulfilled? Another great Saturday matinee movie, though if a bit slow to start off with, it has all the ingredients to fulfil a young boys dream of cowboys fighting dinosaurs. Yes the acting in parts is wooden and the film doesn’t have any of the underlying subtext that many of the earlier films of its type had, but you can’t disagree with the fun that can be had with such a film. Well worth a watch, now where’s my six-shooter, I’m gonna bag me a dinosaur.